One of the newest metal detectors to hit the market is the new Makro Gold Racer . These are built in Turkey, but they are perfectly suited for gold detecting here in the United States. I recently had a chance to spend several days using this new detector and I was quite impressed with its features and capability to find gold. The Gold Racer is a very low frequency (VLF) detector. This is a technology that the vast majority of gold detectors on the market use today. Some of the other popular VLF detectors include the Fisher Gold Bug, Whites GMT, Garrett AT Gold, Tesoro Lobo Supertraq, and dozens more. Honestly, there have not been great advances in VLF technology over the years. One of the most popular gold detectors of all time, the Fisher Gold Bug 2, is still used today by many gold hunters and considered by some to be the best of all-time, particularly for hunting tiny gold nuggets and fine gold veins in quartz. What really caught my interest about the Makro Gold Racer was its high operating frequency of 56kHz. This is considerably higher than most other detectors being made today. This higher kHz makes the detector more sensitive to small gold, but it can also cause more instability and threshold chatter when using them in highly mineralized ground. I believe this is one of the main reasons that most detectors being sold today a lower frequency which makes it more user-friendly to the majority of metal detector users who don’t have the experience or patience to learn how to use these more sensitive detectors. That is great for them, but for those of us who are serious about gold hunting there have been relatively few VLF detectors on the market to really get excited about in recent years. So back to the Makro Gold Racer… my first weekend excursion with this detector was a great trip. I ended up finding a lot of small nuggets in an area that I had hunted previously with other detectors. I am not certain if I simply missed these nuggets, or if the previous detector could not hear them. Regardless, the Gold Racer hit on them with good clarity. Its ability to find small gold was not particularly surprising since I knew this detector ran at such a high frequency. What I really liked was how smoothly the threshold ran in some fairly hot, reddish, iron rich soil conditions. When using another detector in this area previously, I noted that it was considerably less stable than the Gold Racer which I really liked. I like how lightweight this detector is. It weighs just 3 pounds including the batteries along with the 5” x 10” DD coil, so it was really no trouble for me to swing all day with little fatigue. The discrimination features on the Gold Racer are really good. In fact, identifying shallow iron trash targets really were simple. With a properly ground balance detector, I found that the target ID would reliably hit around 20 on the visual display. The numbers would remain solid and didn’t bounce around too much so I could be pretty confident that I wasn’t walking away from gold that would hit more reliably in the 40-50 range. I did not use the true discriminate features on this hunt, since the area wasn’t exceptionally trashy and I was able to use the target ID to make my decisions on digging. Discrimination will also be less sensitive to small gold nuggets, so I did not want to miss those smaller pieces by running in disc mode. However, in a trashier location the disc feature will likely get used in the near future. I can definitely see that the Makro Gold Racer is probably going to gain a following not only as a gold detector but also as a good unit to use for relic hunting as well. I will likely hunt some old mining camps soon future to see just how well the discrimination works on this detector. Comparing different gold detectors is always challenging to do, especially without having had the chance to thoroughly play with all the various setting and features of the detector. There are other VLF detectors that I have used for over a decade now, so I am very familiar with them and the “language” that they speak. I will tell you that the Makro Gold Racer really has impressed me so far with the short amount of time that I have used it. I have found enough gold with it already that I know it can do what it is designed to do. More importantly, I have found some very small gold with it, which is what I really look for in a good VLF gold detector. I will be doing more testing with the Makro Gold Racer throughout the summer, and plan to experiment more with the discrimination modes and various other features of this detector. 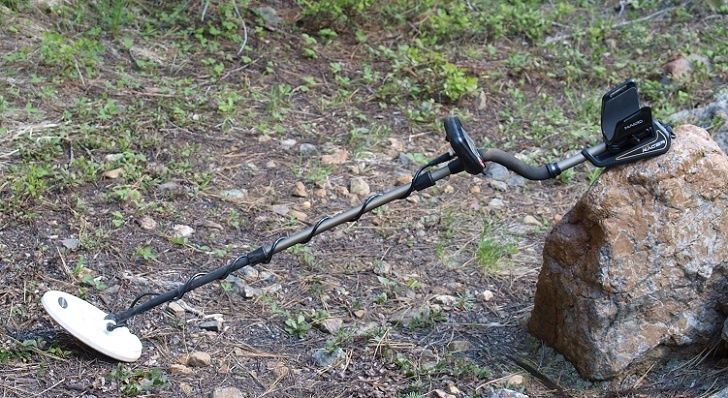 I am confident in saying that I have high hopes for this metal detector, and it is one of the few VLF detectors that has hit the market in recent years that I have been truly impressed with. It may soon become my favorite detector for hunting small gold in bedrock, but we will see as I get a chance to use it more. With the short time I have been using it, it does appear to have a slight edge over several other detectors that I have used in the past.